Offering you a complete choice of products which include epdm rubber profiles. We manufacturer EPDM Rubber Profiles used in Solar Water Heater. Our EPDM seals are use to prevent air, moisture, water and dust from entering into the Heaters. This feature extends the durability of the product for a longer time period. Profiles are manufactured using premium quality raw material and are available in the markets at competitive prices. Our range of product known all across the world for its easy operation and high efficiency. 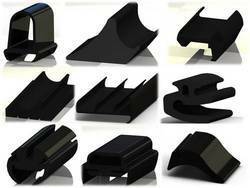 Rubber Profiles/Seals For Thin Film Solar PV Panels. The Prices of the product varies as per the drawing, design, dimension & specification of product.